Looking round this year’s Restaurant Show www.therestaurantshow.co.uk , I was delighted to find Venice Bakery UK www.venicebakeryuk.com sampling its delicious range of gluten free and dairy free pizza bases, available as plain or herb seasoned in sizes 5in to 12in. What’s more, as they are both gluten free and dairy free Ray and I can both eat them which is a bonus. They are also free of wheat, eggs, corn and nuts as well. I first discovered the company at The Allergy and Free From Show in London www.allergyshow.co.uk. Don’t miss the Liverpool show 26-27 October. I’ve tried gluten free pizzas in several high street chains but they tend to be slightly burnt, hard and biscuit-like so you can hardly get your knife through them – almost like burnt toast. With Venice Bakery’s pizza bases, the dough is soft, moist and chewy – just like pizzas should be. I can’t recommend them highly enough – you can order direct from the web site. Great that they are promoting these pizza bases to restaurateurs and caterers and I hope that we’ll be able to find these pizzas everywhere when dining out. As the company points out, foodservice operators will need to comply with new EU Food Information Regulations which come into force on 13 December 2014. Under the new legislation, restaurants will need to clearly identify 14 common food allergens on menus and packaging. Or staff will need to be able to provide verbal information on the allergen contents of each food dish that is served to a customer. Good news for people like us who suffer from allergies because it means there will be no doubt about what a dish contains. As things stand, the waiting staff usually have to check with the kitchen if a dish contains certain ingredients, but if it’s listed in the menu, it will help everyone. 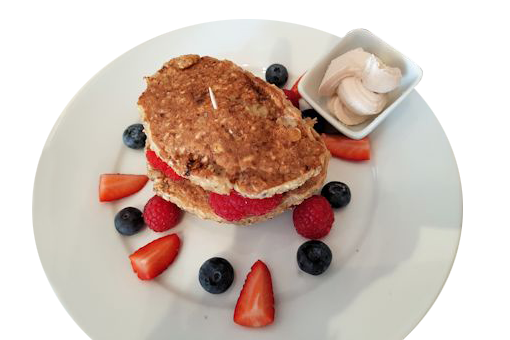 Staff education is also key to the problem of dining out with a food allergy, as some waiting staff don’t have a clue as to what gluten free or dairy free means and we have walked out of some restaurants where they haven’t understood. Other restaurants embrace allergies, such as Wagamama www.wagamama.com – the Kingston branch was very helpful in pointing out to us which dishes we could consume. While we’re talking about food labelling, don’t get lazy about checking what ingredients are in foods. Ray who’s dairy free can eat Jacob’s fig roll biscuits because they don’t have milk in them. I didn’t check the ingredients in Tesco’s fig rolls – fortunately Ray did only to discover they contain milk. You can’t be too careful! 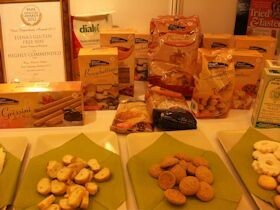 Another discovery at The Restaurant Show was Elena’s Gluten Free Way www.elenasgfway.co.uk, run by Elena Buchberger. The stand was showing the complete range of dairy, gluten and wheat free Italian Dialsi pasta made from corn and rice flour. Elena, a former architect, said she’d noticed an increase in the number of chefs approaching her for gluten free products. Other products include cookies, bread, breadsticks and flours. You can order direct from the web site, which also has a wide variety of recipes. Also enjoyed Whynut’s www.whynut.co.uk selection of lightly salted pistachio kernels, winner of a Gold Star Great Taste Award. Interesting to hear the latest craze forthe Cronut in America, a croissant-doughnut hybrid. In London Bea’s of Bloomsbury’s www.beasofbloomsbury.com introduced the Duffin, a cross between a doughnut and a muffin and now the Townie – a cross between a brownie and a tart. Sounds great – wonder if someone will come up with a gluten free and dairy free version? BBC Breakfast created the“Muffitt” a cross between a biscuit and muffin. I’m going to try and convert the recipe into a gluten and dairy free version. Will let you know how I get on.